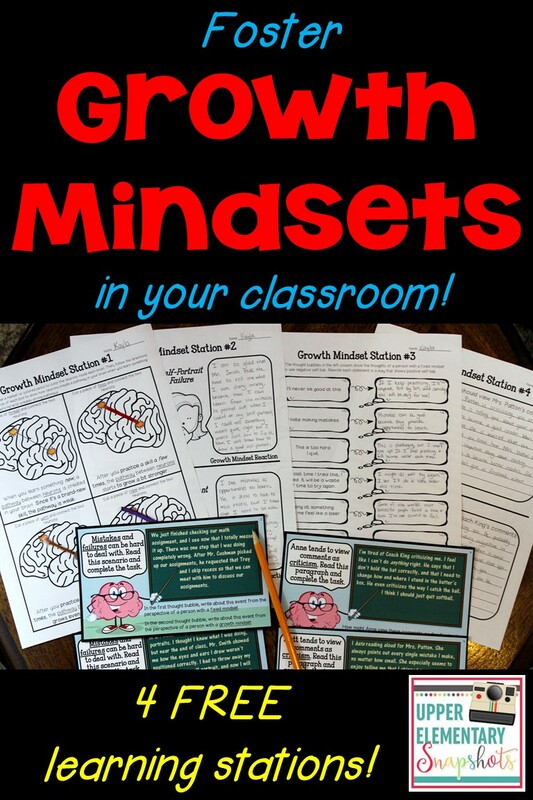 Foster Growth Mindsets with Free Learning Centers! Growth mindset… it’s one of my favorite movements to sweep across the education world in recent years. 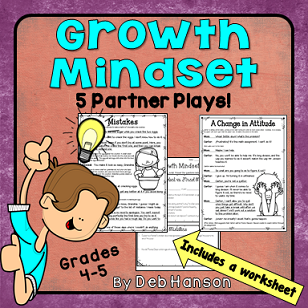 After reading Mindsets in the Classroom: Building a culture of Success and Student Achievement in Schools by Mary Cay Ricci, I decided to create a Growth MindsetPowerPoint and a set of partner plays. When I finished those items, I thought I was done creating for this concept. However, during a recent loooooong road trip, I was inspired to create some growth mindset stations, and make them available for free to our blog readers. Because of my ESL background, I have a love for visuals. This station is based upon what researchers have discovered about how our brains operate. Researchers have discovered that when we learn a new skill or piece of information, pathways are created in our brain between neurons. These pathways are weak at first, but become stronger as we repeat and practice the skill. To show how these pathways become thicker and stronger with repeated practice, I created the following visual. Students begin by using a colored pencil or marker to color the neurons shown in each brain. Students then glue (or tape) thread on the first image, ribbon on the second image, and then yarn and rope (or chord) on the last two images to connect the neurons. Dealing with mistakes and failures in the most positive way possible is the focus of this second station. Students read the scenarios on the two cards. At the bottom of each card, students are instructed to write about the event from the perspective of a person with a fixed mindset in the first speech bubble on their worksheet, and to write about the event from the perspective of a person with a growth mindset in the second speech bubble. As we teachers know, positive self-talk is powerful. A few upper elementary students do this automatically… it’s simply how they think. 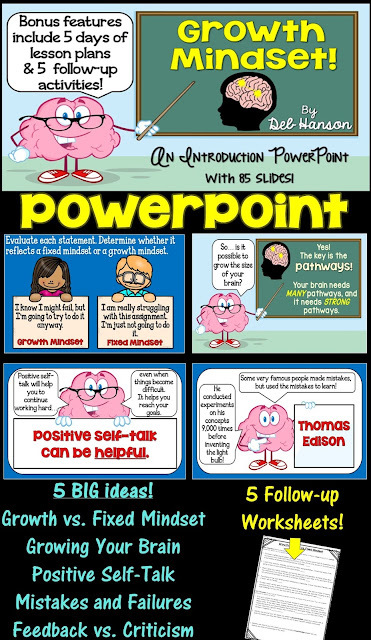 Many students, however, need to train their brain regarding positive self-talk. Negative self-talk happens all too easily. Replacing that negative self-talk with positive self-talk is the focus of this station. Students simply replace the negative statements shown in the left column by writing positive statements in the right column. If there is enough time, I also allow my students to cut Xs out of construction paper and glue them on top of the negative self-talk thought bubbles. Another thing we teachers know is that the ability of students to differentiate criticism from feedback is an ability that will benefit them for the rest of their lives. When students arrive at this station, they read the scenarios on the two cards. At the bottom of each card, students are instructed to pretend that they are talking to the classmate described in the scenario. They are to write what they would say to help that classmate view the teacher’s (or coach’s) remarks as feedback rather than criticism. If you’d like to try using these stations in your classroom, click HERE to download! Also, be sure to check out Meg's post about growth mindset! Do you need another station? Visit my personal blog, Crafting Connections, for one additional free station! Also, feel free to check out my PowerPoint and partner plays- just click on the images below. These stations would be an excellent follow-up activity after working through the PowerPoint with your students. The stations line up with the 5 main topics covered in the PowerPoint. Thanks for visiting today! Don’t forget to hop over to my blog to grab one additional station!